When I learned I was diabetic, it was right around the holidays. My doctor gave me an ultimatum: "Start eating keto, or I'll put you on insulin." I chose keto (and am so thankful to my doc for telling me about it, especially now that my A1C is normal!). But I confess the idea of the holidays without all my favorite Thanksgiving and Christmas foods was depressing...until I learned I didn't have to feel deprived while eating low carb. 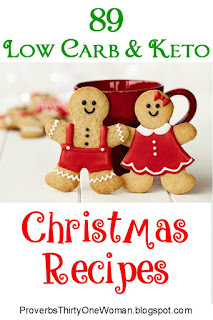 I can make keto-friendly versions of all my favorite holiday foods - and they taste fantastic! 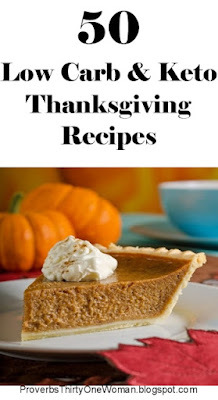 Last year, I wrote a post on keto Thanksgiving foods, so this year it seemed only natural to focus on low carb Christmas food. You'll notice I haven't included the main star of the show: Whatever meat your Christmas table usually features. That's because meat is (duh) low carb, so unless you're used to meat covered in honey or some other form of sugar, you probably don't need a special recipe for it. Instead, I've focused on all the other fattening stuff we tend to eat around Christmastime - whether it's gingerbread cookies leading up to the big day, high sugar egg nog on Christmas Eve, sugary cinnamon rolls for Christmas breakfast, fattening mashed potatoes for Christmas dinner, or Christmas dessert. Enjoy! Cutout Cookies by Maria Mind, Body, Health. 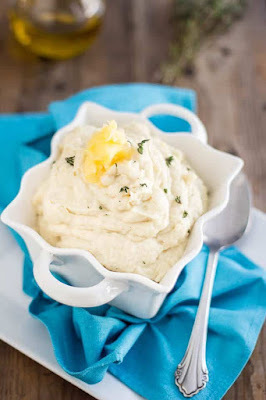 Cauliflower Mash from The Healthy Foodie. 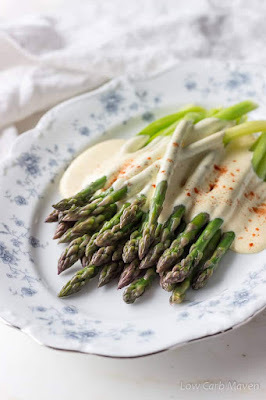 Asparagus ith Hollandaise Sauce by Low Carb Maven. 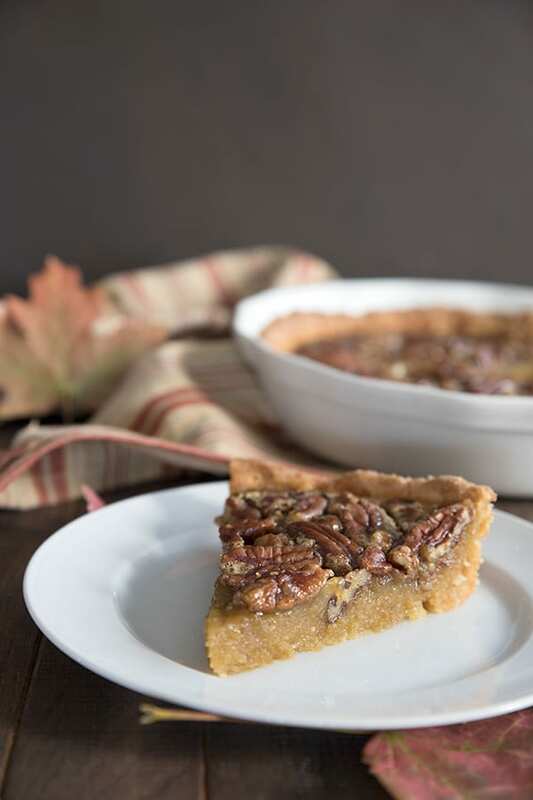 Pecan Pie from All Day I Dream About Food. Find EVEN MORE Keto Christmas recipes on my Pinterest board! The modern holiday season is largely about months of eating sugary, fattening food, from mashed potatoes and stuffing to cookies, eggnog, and pie. As if this weren't difficult enough for those watching their health, our society tends to frown upon those who don't indulge. More than once, I've been pressed - sometimes not nicely - to eat food that would literally make me sick. "Lighten up! Moderation in everything!" is today's motto. If you're eating keto or low carb simply to lose weight, you may not be as strict as I am about holiday eating. 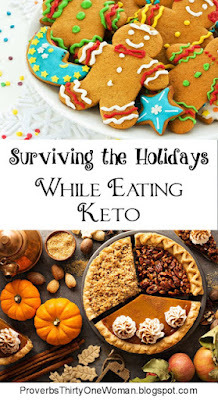 Maybe it's easier for me to stick to keto because as a diabetic, I know traditional holiday food will spike my blood sugar, making me feel almost immediately ill. But the truth is, cheating hurts every keto-eater. You've worked hard to improve your heart health, reduce inflammation in your body, get your body burning fat, and just generally make yourself feel better. When you cheat, you set all that back and allow carb cravings to grab a foot hold. Not worth it. No way, no how. So how does one navigate food during the holiday season? Here's what works for me. Sadly, most Thanksgiving and Christmas sides are unhealthy and definitely not keto. If you're the host (and assuming most people present are carbavores), serve a few keto sides that everyone can enjoy. If you're a guest, bring at least one side that's keto. Do remember, however, that even keto holiday sides have carbs; don't make the mistake I made my first keto Christmas: I whipped up 3 keto sides (mashed cauliflower, stuffing, and green beans), but still managed to spike my blood sugar because I simply ate too much of each. Personally, I find getting through holiday parties more difficult than surviving family dinners. Whereas most families are happy if you contribute food to a big meal, you won't always have the opportunity to bring food to a holiday party. Still, if you're given the opportunity, do bring keto food. There's no need to tell anyone it's keto unless you want to; keto food is so delicious, most people will never suspect they are eating "diet" food. Good choices include deviled eggs, dips with pork rinds, cheese balls, meatballs, veggie trays with keto Ranch dressing, strawberries with whipped cream, and jalapeno poppers. If you're unable to bring food to a party, seek out keto-friendly offerings, even if it means dissecting your food a bit. For example, you might eat from a cheese or nut tray, or just the meat from a cracker tray. Sometimes you'll need to pick off what's not keto. For example, if there are breaded chicken tenders, peel off the coating. Eat slowly, and always have something uneaten in your hand so people are less likely to offer you unhealthy treats. Above all, whenever possible, eat before you attend the party; it's so much easier to resist when you aren't hungry! I find it really helps to get in some fatty food before attending any event where I have no control over the food.Fat kills cravings and helps you feel full and satisfied. I also recommend avoiding alcohol. Yes, some alcohol is low carb, but unless you have the nutritional information right in front of you, you might be surprised how many carbs are in that glass of wine. (Carb counts vary widely between brands!) Besides, alcohol reduces your will-power to stay away from carby "munchies." This holiday season, somebody is almost certain to give you a plate of cookies or fudge or some other sweet treat. What to do? My advice is to thank them kindly and sincerely, then move on with the conversation. I'd then dispose of the food or give it away to someone the gift-giver doesn't know. This allows the gift giver to know you appreciate their kindness in thinking of you, while also ensuring you don't hurt their feelings. You've probably already run into people who insist keto is unhealthy. (Yawn.) But it may prove especially difficult to navigate naysayers during the holidays. Hopefully, keto won't become the topic of conversation; politely declining non-keto food is usually sufficient - no explanations needed. If strangers or acquaintances push further, it's usually helpful to say, "My doctor has me on a weird diet." (I've yet to meet someone who questions this.) Or sometimes: "Unfortunately, those foods make me feel sick." It can be trickier with people who know you well, since they often feel free to tell you what they really think...and sometimes people who are anti-keto are really strident. Arguing at the dinner table is, I'm sure, not on your holiday wish list, so consider now how you'll handle such situations. Aside from keeping the reasons you eat keto at the forefront of your mind, the best way to survive the holiday food glut is to remember what the holidays are actually about. Thanksgiving isn't about rolling out the door because you're too full to walk. It's about being thankful for your blessings. Christmas isn't about eating sweets all day. It's about celebrating our Savor's birth. Similarly, Hanukkah is really about faith and family, not food. Friends, you've got this. You know keto is good for you and that you'll regret it if you fall off the wagon. You also know you've never regretted not eating a food. (Right??) Keto on! Each year, my family loves to watch the Radio City Music Hall Christmas Spectacular on Netflix. It's available streaming this year, so if you have Netflix, be sure to check it out! Our favorite part, though, is the last 10 minutes or so, where they perform their famous live nativity. It is breathtaking...and always make me teary eyed. If you don't have Netflix, you can find clips of the Radio City nativity all over YouTube. Here was the best one I could find. It's only a short portion of the nativity play, and it's a slightly shaky amateur video, but I still think you'll enjoy it. 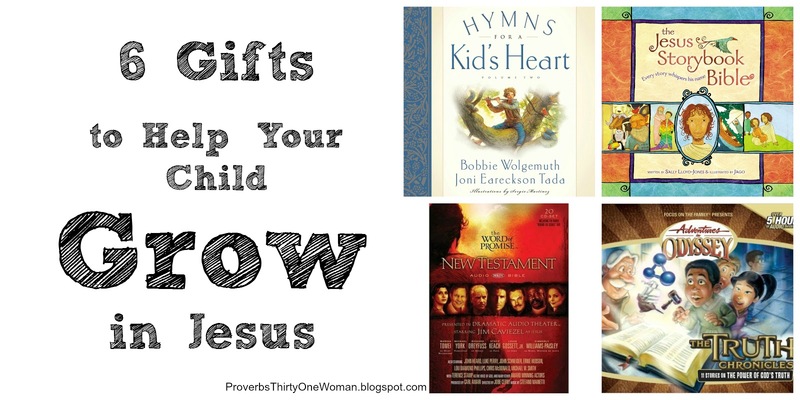 Christmas is a perfect time to invest in your child's spiritual growth. Amid the toys and tinsel, it offers the opportunity to give gifts that may impact your child's entire life. 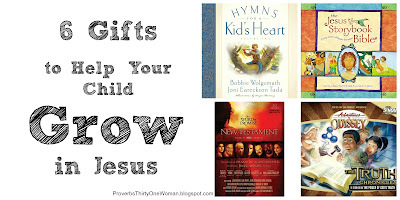 Whether you have babies, elementary kids, or teens, consider what gifts will steer them closer to Christ. Here are the ones that have had the greatest impact in my family's life. 1. 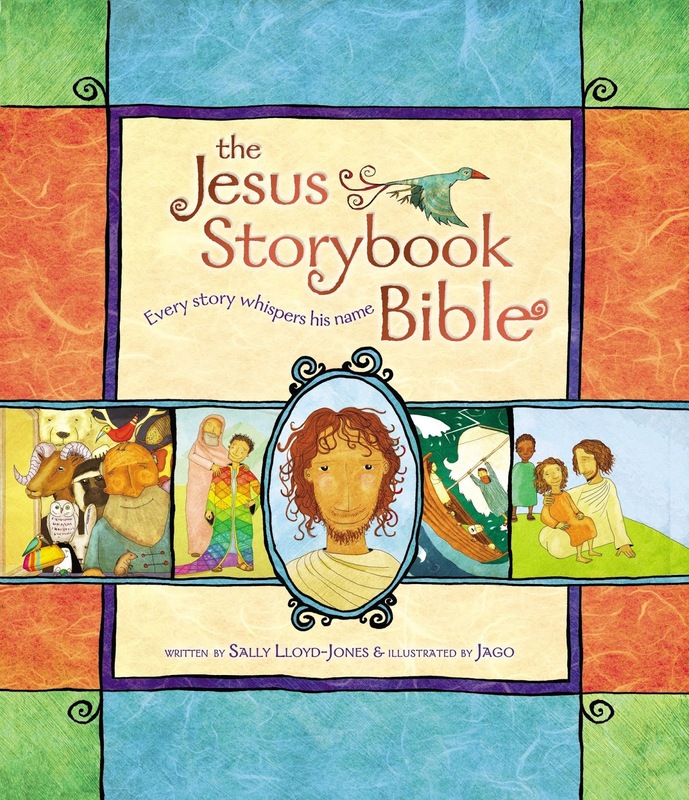 The Jesus Storybook Bible. A good children's Bible is paramount in helping your child learn about God. 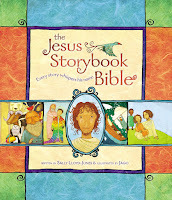 And truly, there is no better children's Bible than The Jesus Storybook Bible. 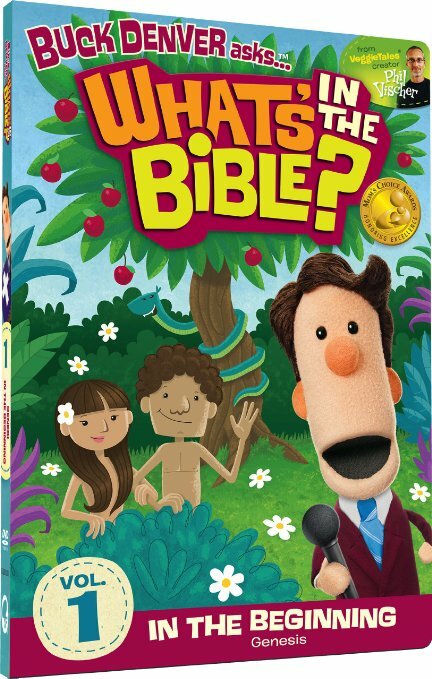 Not only is it filled with illustrations children love, and told in a simple way anyone can understand, but it uncovers deep spiritual truths you find in any other children's Bible. Do your family a favor and buy not only the beautiful hardback version, but the version that comes with a CD. That way, you have multiple ways to immerse your child in God's Word. 2. The Bible in audio format. 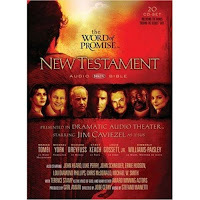 For teens, aside from their own print or ebook copy of the Bible, an audio version is essential. Fill their heads with the Word! 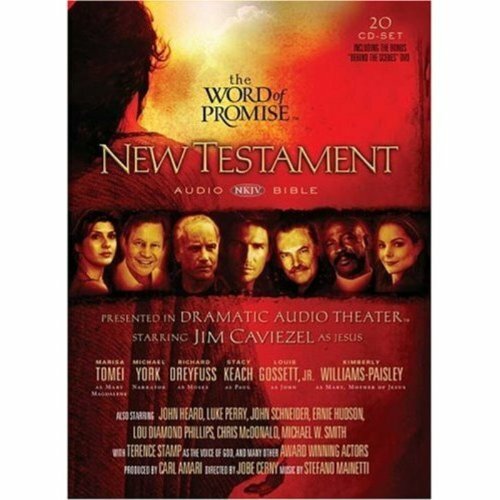 One excellent audio Bible is The Word of Promise, featuring such top notch actors as Jim Caviezel, Louis Gossett, Jr., Michael York, Richard Dreyfuss, and Lou Diamond Phillips. It's available in several formats: CD, MP3, and Audible. Recommended Age: Teens and adults. 3. Adventures in Odyssey. 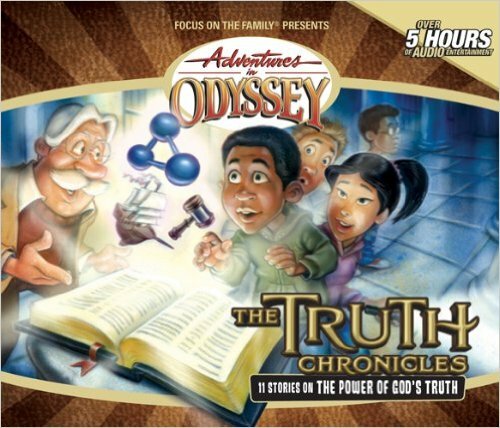 My children often go to sleep listening to an audio drama, and no audio dramas have had a more positive impact on their spiritual life than the Adventure in Odyssey radio dramas by Focus on the Family. There are about a gazillion of them, and each discusses Christianity in an entertaining way kids - and families - love. I can't recommend them enough. 4. Torchlighters. 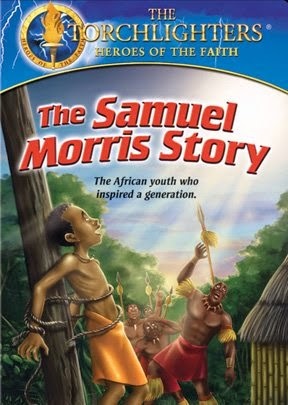 This excellent DVD series teaches kids about Christian martyrs. Does that sound too mature? Or scary? Trust me, it's not. My children absolutely love this series, and it's taught them to think about their own walk with Christ and how they can best serve him. Read more about Torchlighters here. Recommended Age: About age 5 through adult. 5. What's in the Bible. This DVD series is unlike anything I've ever seen before. It teaches not just what's in the Bible, but basic theology, and how the Bible applies to our everyday, modern lives. Recommended Age: Preschool through elementary - although teens and adults who like playfulness will enjoy them, too. 6. Hymns for a Kids Heart. If you don't sing traditional hymns at church, this series is a huge help in bringing hymns to your children. Why bother to teach them hymns? Because traditional hymns teach deep spiritual truths, and make getting through difficult times a bit easier. (What did the apostles do in prison? They sang hymns.) 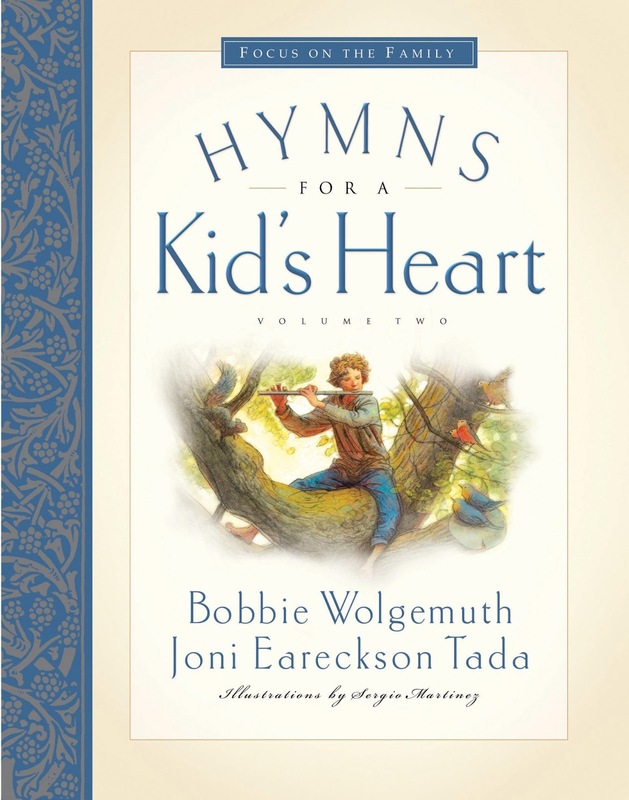 Each of these books is beautifully illustrated, tells the story behind the hymn (why and how it was written), gives complete lyrics and sheet music for each hymn, and comes with a CD containing every song in the book (sung mostly by a children's choir). Recommended Age: Baby through elementary, though teens and adults will probably enjoy the stories (and certainly the hymns), too. Of all our Christmas traditions, I think my kids most look forward to putting up our nativity scene...and making cookies. And truthfully, making cookies is an easy way to say you're thinking about someone during the Christmas season. Just cover the treats in red or green plastic wrap, or make a simple homemade cookie container, and you're ready to hand the cookies over and put a smile on someone's face. So with this sort of good will in mind, here are my family's favorite Christmas cookies to make and give away...or to scarf down ourselves. Gingerbread Cookies - It's hard to beat this traditional cookie. It's perfect for using with cookie cutters - and what kid doesn't love making a mess decorating them with icing and sprinkles? 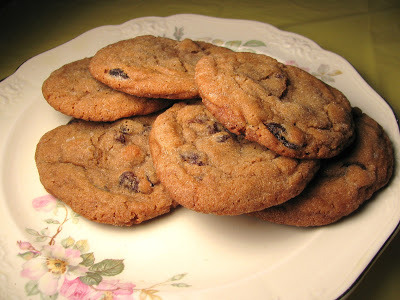 I use a very simple glaze for these cookies: A little powdered (confectioner's) sugar with just enough water stirred in to make a thin paste. 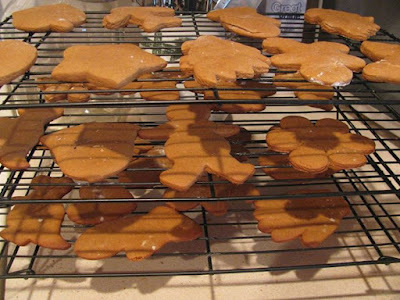 Use a pastry brush to brush it onto the cookies, then add sprinkles or other edible decorations, if you like. 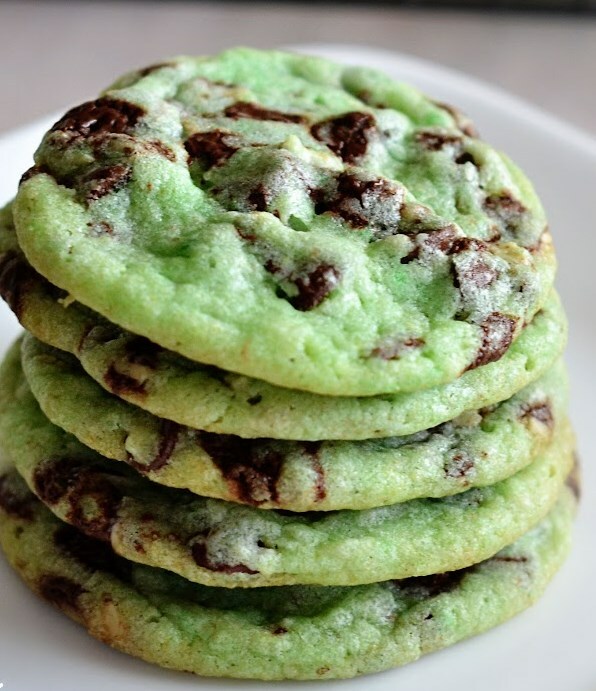 You can also add a drop or two of food coloring to the glaze. 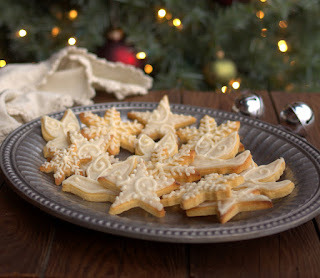 Sugar Cookies - Again, these are great for using with cookie cutters. 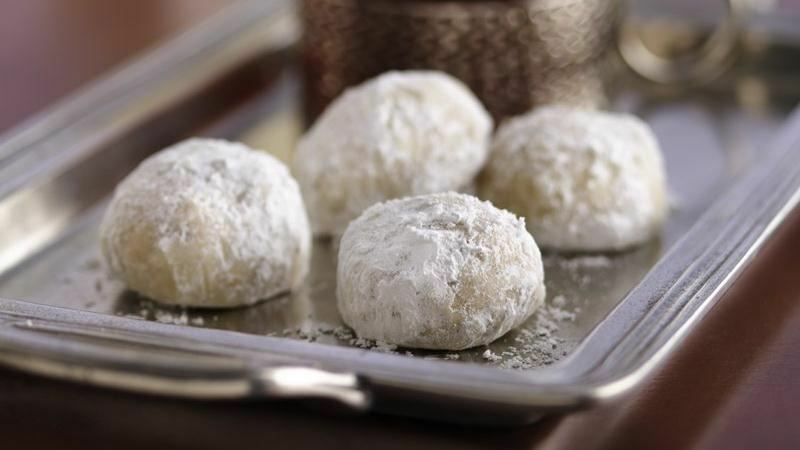 I omit the salt in this recipe and use that same simple powdered sugar glaze on them as I use on gingerbread cookies. Russian Tea Cake Cookies - A friend introduced me to these years ago. They are so pretty - and tasty! 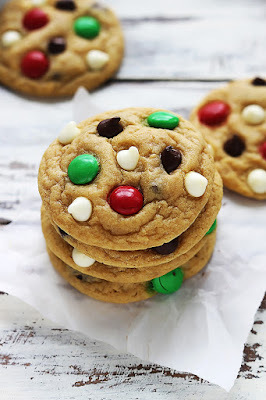 Double Chocolate Chip M&M Cookies - They look festive if the M&Ms are red and green, and I've yet to meet someone who doesn't like them! It can be truly difficult for children to remember what Christmas is all about. Those pretty Christmas lights and fun presents and jingle bells are pretty darn exciting. I'm not going to suggest you stop making cookies or handing out gifts come Christmastime, but I do encourage you to steer your children toward Christ all this Christmas season. Now - before the hustle and bustle of other holiday planning takes over - is the perfect time to take just a few minutes to plan some simple ways to do that. Here are my favorite dozen. 1. 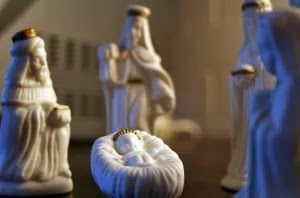 Put up a nativity scene - preferably one the kids can play with. It doesn't have to be expensive. For example, you might try this free printable "paper doll" nativity set, or this toilet paper roll set kids can color themselves. 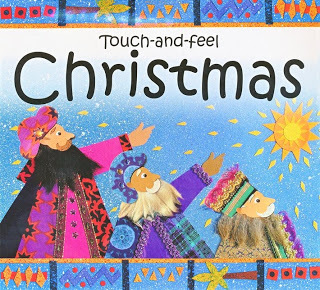 And why not read the Biblical Christmas story to the children while they work on it? 3. Bake (and eat) a birthday cake for Jesus. 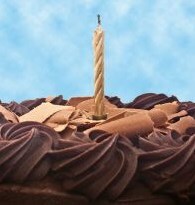 Hint: It doesn't have to be a typical birthday cake. At my house, we've used everything from gingerbread to monkey bread. But we always put a candle on it and sang "Happy Birthday" to Jesus. 4. Find somebody to serve as a family. Maybe an elderly neighbor needs yard work done or a dinner cooked. Maybe there's a local shelter where your family could volunteer. Maybe your kids could do extra chores or find jobs with neighbors in order to raise money to give a needy family livestock. It doesn't really matter what service you choose - just that your children understand you're doing it because Jesus told us to serve others. You can also explain that being born and dying on the cross was Jesus' service to us. 6. Pick a few activities to go with those Christmas books. They don't have to be complicated, but any hands on activity will help your kids remember the books better. 7. Download Thriving Family's free Advent calendar. This magazine, published by Focus on the Family, creates a new Advent calendar each year, so if you don't love this year's, go ahead and search the site for previous year's calendars. 8. Make a paper chain - and on each chain, write one of the names of Jesus. Explain to your children why Jesus has each name. 9. 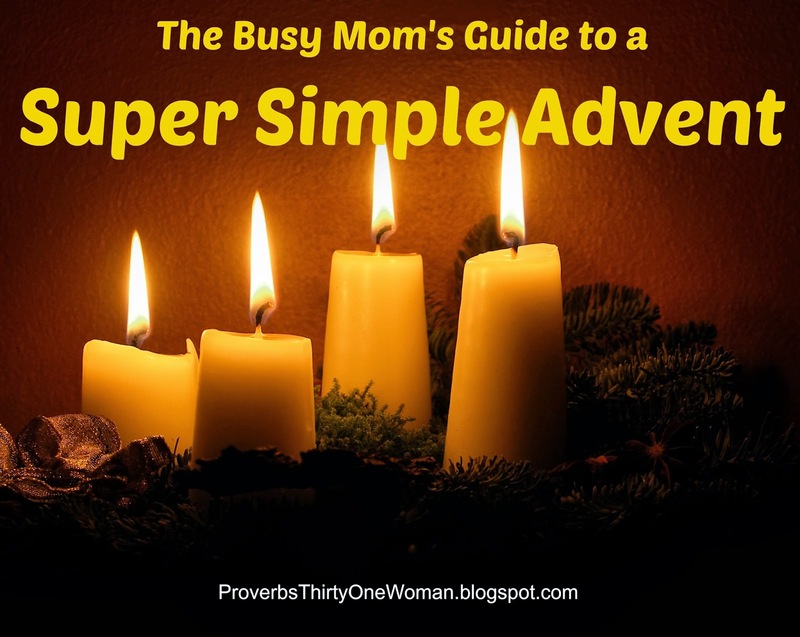 Use this free Advent plan to go along with The Jesus Storybook Bible (a children's Bible that, in my opinion, every family should own). 10. Select Christmas movies that are about the Biblical Christmas story or the spirit of Christmas. For example: Why Do We Call it Christmas?, The Little Drummer Boy, A Charlie Brown Christmas, and The Crippled Lamb. Courtesy of James Petts and Wikipedia Commons. 11. 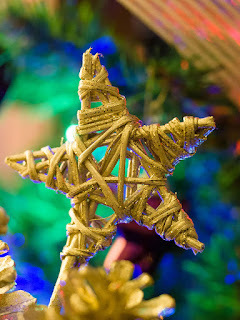 If possible, make your Christmas decorations reflect the real meaning of Christmas: Think angels, bells, and lights. 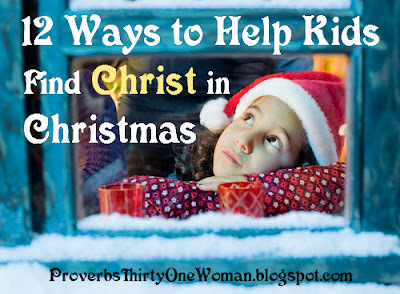 Now it's your turn: What are some of your favorite ways to help your children find Christ in Christmas? Share your ideas in the comments below! In recent years, it's been my habit to share a Christmas song with you on Christmas Eve. This year, I want to share a carol that may seem sad and sober to some - but which is full of meaning and hope for Christians. Henry Wadsworth Longfellow wrote the lyrics to this carol during the Civil War, and he wrote it while in personal despair. He'd lost his first wife years before, and had recently lost his second wife in an even more tragic way. She'd just cut their young son's hair, and wanted to preserve a lock of it. But while melting wax onto the end of the lock, her dress caught fire. Longfellow tried to save her, but she died of her burns a day later. Even more tragedy surrounded him, however. His country - a nation his forefathers had fought hard to create - seemed to be falling apart in war. And one of his sons, fighting in the war without his father's approval, was wounded. And so, when Longfellow sat down to write this unique Christmas song, he really was suffering, as someone who mourns during the Christmas season can only fully understand. Yet, in the final verse of the song, he remembers Christ's return, when there will be true peace, as we've never known before, on earth. 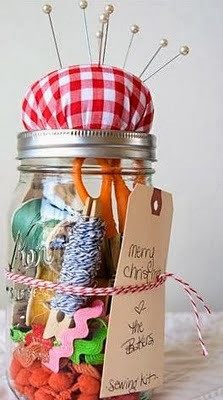 Home canned foods and gifts in a jar both make excellent Christmas gifts. Not only are they yummy (or, in the case of some gifts in a jar, useful), but they say "You cared enough to take the time and creativity to make this for me." 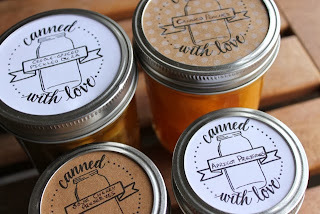 In years past, I've discussed some fun ways to dress up your jarred gifts, but this year I specifically wanted to focus on labels. There are a ton of free jar labels available online - just print them off, cut them out, and attach. But to help you wade through all those offerings, I've rounded up what I consider the very best the Internet has to offer. These are the type of labels designed to fit on the lid of canning jar. 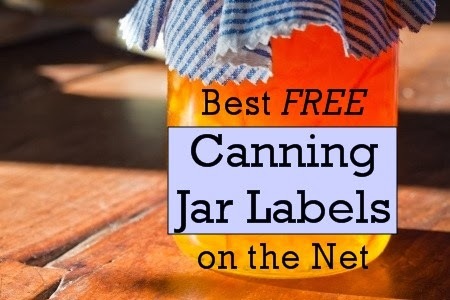 You may either glue these labels on top of the lid or simply set them on top of the jar lid and hold them in place with a jar screwband. 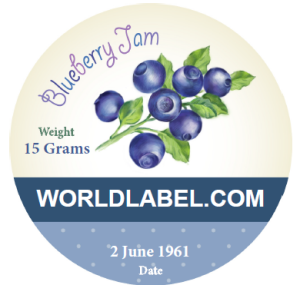 Old fashioned labels from World Label. bumbleberry (mixed berry), and marmalade. * Simple "Homemade Just for You"
* Red and white "Jam Made with Love By..."
* Beautiful fruits: cherry, peaches, lemons, tomato, pear, grapes, pumpkin, strawberry, currents, raspberry, and blackberry. * Simple "Made With Love"
Christmas presents and penguins from World Label. 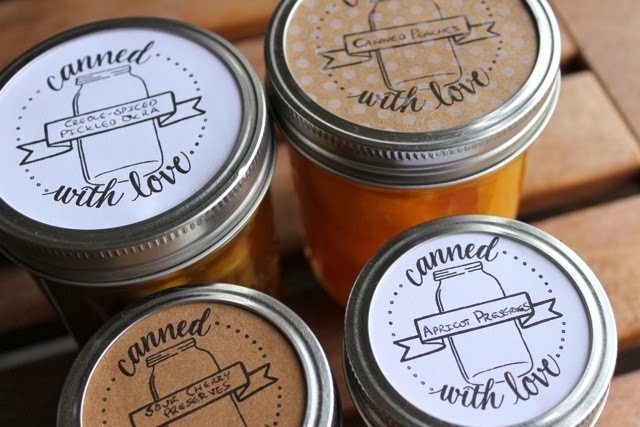 These labels are designed to glue on the front of a jar - just like labels on grocery-store purchased canned goods. For best results, print on paper with a sticky back. * Cute blue and red "Made with Love"
Old fashioned strawberries from Happy Miscellany. These tags tie on with string or ribbon. Mason jar tags from Cottage Industrialist. 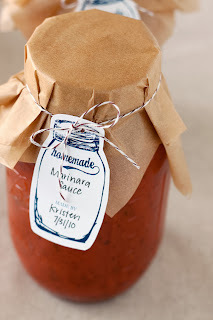 * Use old Christmas cards to create jar labels. * Use muffin liners as decorative toppers. Or use brown kraft paper. Tie with string, or just put a jar ring on. This year, a great many families are worried about having enough money for Christmas. 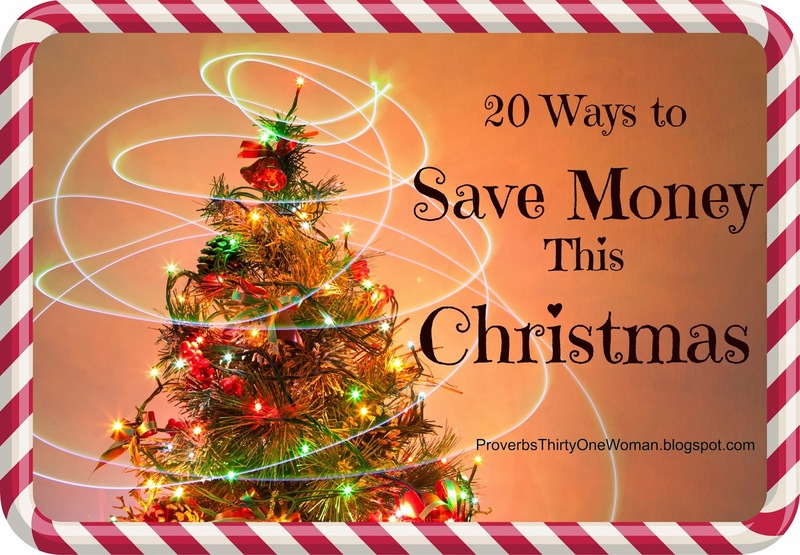 Times aren't so easy, and nobody wants to go into debt buying gifts and decorations. Happily, there's no need to go into debt. Christmas can be really wonderful without spending a bunch of dough. Not sure how to make that happen? Check out the tips below. * Buy wrapping paper, tissue paper, ribbons, and bows at the Dollar Tree. Or, if it's cheaper, buy large rolls of brown parcel paper at an office supply store; tied with string or bows, they have a lovely, old fashioned look. * Make your own gift tags. 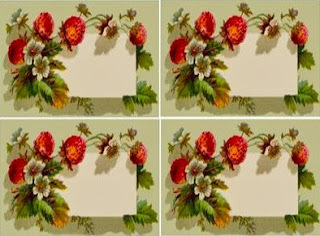 The easiest way to do this is use scraps of wrapping paper, folded in half. Other ideas include cutting out shapes from last year's Christmas cards, or using inexpensive Dollar Tree card stock. * Buy fewer gifts. Jesus only received three. * If you choose to buy more expensive gifts, divide the cost among two or more people. For example, one year I paid a portion for my husband's new grill. His parents and grandma pitched in the rest. * Don't buy new decorations. Do you really need another Christmas tree ornament? If you usually purchase fresh wreaths and garlands, make them yourself or consider buying re-usable (faux) greens. * When buying a real tree, choose a variety that costs less. For example, in our area, noble firs cost at least $15 more than pine trees. Whatever type of tree grows most easily in your area is likely less expensive than something that has to be trucked in. * Think practical when it comes to gifts. This is the way many Americans gave gifts until fairly recent times. Instead of overloading kids with toys, for example, children were given new shoes, clothes, books, other practical items - and perhaps one or two toys. * Don't send Christmas cards. I know many people think this is a heretical idea, but sending cards is expensive - and, dare I say it, wasteful. Instead, send digital cards...or better yet, digital Christmas letters. * Buy gifts throughout the year. It's too late to start that now, but once the new year begins, pay attention to sales and go ahead and buy gifts you know your loved ones will love. * Instead of focusing on stuff, focus on Christ, the "reason for the season." For ideas on how to do this, see the bottom of this post. * Don't give everybody gifts. It's a nice thought, but often you're just buying stuff they don't need, anyway. For non-family members or extended family, don't give gifts - or give things like food or simple homemade gifts, like gifts in a jar. * When it comes to food, watch for sales and buy what you need when the price is lowest. For example, many foods associated with Christmas are also eaten around Thanksgiving - and are deeply discounted to get you into the store. 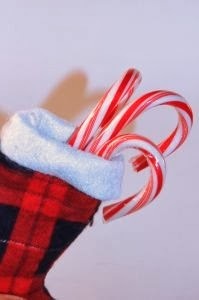 * Do stockings only for the kids and fill them with practical items like new toothbrushes and fun pencils and erasers. * Don't go shopping without a plan. Know what you want to buy in advance, and always check prices online, too. Don't forget to check eBay, where often you can purchase brand new items for less. * If there will be lots of adults wherever you spend Christmas, do a Secret Santa type gift giving: Each adult draws the name of one person. Each adult gives only one gift. 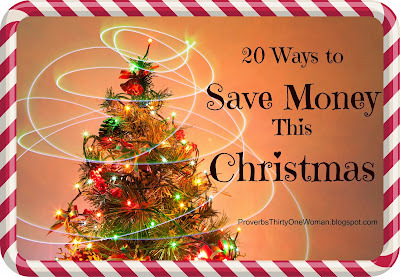 * Don't have the money to buy an Advent book? Use a free reading plan. Thriving Family magazine (along with Adventures in Odyssey) offers a free Advent activity calendar. The Internet is also packed with Advent reading plans you can use with any Bible. Focus on the Family offers a free family reading and activity plans. * Use a chalkboard to count down the days. Kids love this. * Make a simple Advent calendar. Probably the easiest is to string up folded cards on string or ribbon, something like you see here. (There's no need to make the board that goes along with it - and the cards don't have to be fussy, either. In fact, I suggest enlisting the artistic talents of your children for the cards. Your job will be to write inside the cards.) Don't get fussy with the activities for each day, either. Keep it really simple! Things like "watch a Christmas movie" and "make a paper snowflake" work perfectly. * If you're using the Jesus Storybook Bible, here's a nice Advent calendar go-with. It may be a bit too much work though. Maybe you can ask Grandma to make it for the kids. * Check out this list of Advent projects for kids. 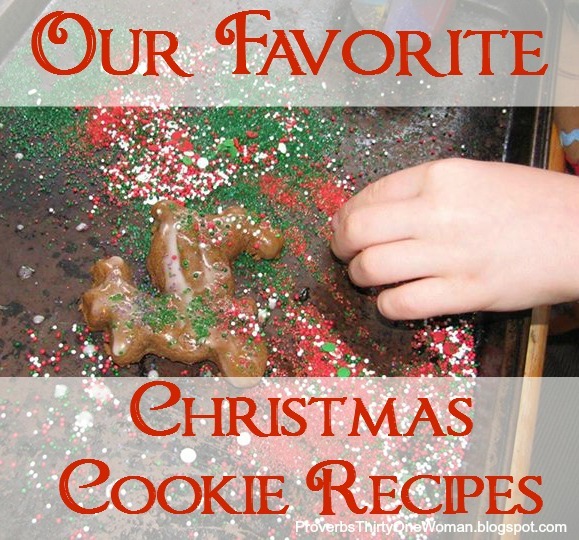 * And here's a list of fun activities to go along with your children's favorite Christmas books. Don't get overwhelmed by the list's length. 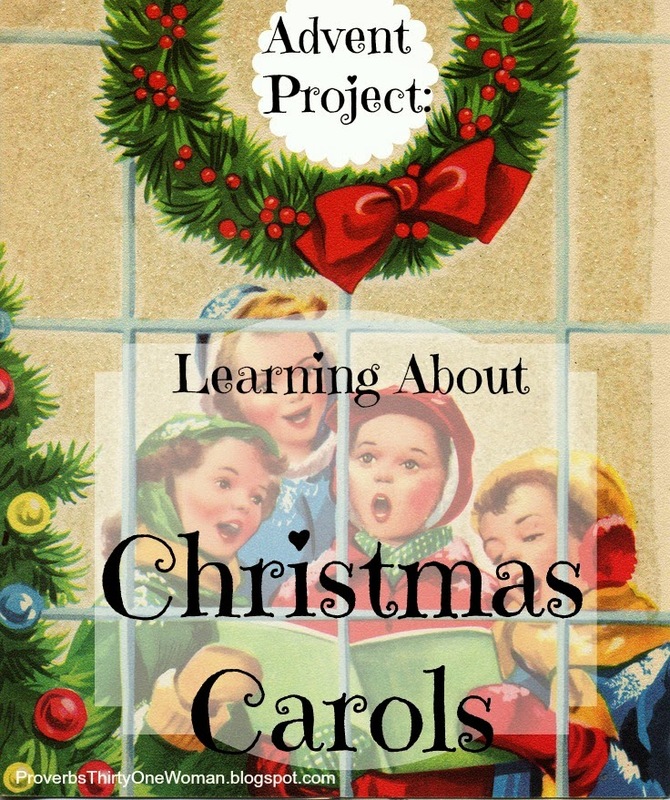 Pick just a few projects that focus on the true meaning of Christmas, and leave it at that!